The New Year, pasta, Cenegenics, Gingrich, the Ark, solar energy, prayer, self-delusion and more! The staff of the Skeptic Friends Network hope that everyone had a safe and happy New Year! Cooking Pasta in a Skillet! - Skepticism about it, and comments by an expert in the field. Dr. Jeffery Life and Cenegenics - Thread on lifestyle with hormone supplements resurrected. Gingrich and EMP - More political smoke obfuscating an important aspect of EMP. Keeping track of Ham’s Ark Park - Ken Ham’s fundraising falls way short of target. Solar (PVC) Energy impossible? - “Yes,” says Porter Stansberry, who peddles his own agenda. Editor’s Choice: The Lord works in mysterious ways… - Powerful image questions power of prayer. You Are Not So Smart: A celebration of self delusion — You Are Not So Smart is a blog by journalist David McRaney whose main theme is that we all delude ourselves, pretty much because our brains like it that way. We tend to be guided by cognitive biases that often affect our everyday decision-making without our being aware of them. Each post opens with a title and a line about a misconception we hold, and that is immediately followed with another sentence. The Truth. Then comes McRaney’s explanation for the The Benjamin Franklin Effect, which (like all his posts) is well written, witty, and easy to understand. He digs into the research on the subject, without hitting us with all the dry details that are not really necessary to making his point. He is, after all, a journalist with a heavy interest in psychology. But McRaney does his research and the studies are in most cases cited and linked to. I’ve been this doing since choosing You Are Not So Smart as my pick. This one has been hanging around for at least three weeks now, and here I am, working on it today with tonight as my deadline. Thinking about thinking, this is the key. In the struggle between should versus want, some people have figured out something crucial — want never goes away. Procrastination is all about choosing want over should because you don’t have a plan for those times when you can expect to be tempted. You are really bad at predicting your future mental states. In addition, you are terrible at choosing between now or later. Later is murky place where anything could go wrong. Yup! This is what I’ve been doing today and for the last two weeks, because I can’t ignore my “friends” even knowing that I had to get this done. You Are Not So Smart is a blog I started to publicly explore our self delusions through narrative journalism. When it started, I had a love for psychology, some skills as a writer, and a lot of curiosity, but I had no idea how much material was out there to explore. So far, this has been fun, enlightening, and humbling. The central theme here is that you are unaware of how unaware you are. There is branch of psychology and an old and growing body of research with findings that suggest you have little idea why you act or think the way you do. Despite this, you create narratives to explain your own feelings, thoughts and behaviors, and these narratives become the story of your life. I am not the only person writing about these topics, or the first, or even close to the smartest. I want my stuff to be fun and entertaining, but you can deep dive into many of these topics at Wikipedia’s biases page, Wikipedia’s fallacies page, and Wikipedia’s heuristics page. I, David McRaney, am not a psychologist or an economist. I am a journalist and fan writing about what those super-smart and hard-working people are discovering on these topics. Sometimes, I get it wrong. I’m doing my best to translate it all and make it fun, but If I’m wrong and you know it, please let me know instead of flaming me in the comment sections. These things can be edited and corrected. I welcome assistance in clarifying the concepts. In addition, if you are new to these concepts, please don’t stop here. This blog (and the book) should promote discourse and provoke thought. Do your own research. Remember, my synthesis of the topics that I research is just my own interpretation of facts. I try to include all the sources I pull from so readers can come to their own conclusions. If you feel like an attribution or citation is missing, please let me know so I can add it. So there it is. Do navigate to You Are Not So Smart. My thinking is that it’s the smart thing to do. Wednesday: We had two log-less chats. Sorry but will be no summary for the last two chats. Well… There is this. Chat did happen and at one of them, I can’t remember which one it was, we learned that dry pasta can be cooked in a skillet. That was the news from sailingsoul. I was skeptical. We ran it by chefcrsh, who really is a chef, and that inspired him to create a video for his blog on how to cook perfect pasta in a skillet, faster, easier and in much less water. Who says nothing important happens at chat? Strain Game: Could information about a lab-made virus really help evildoers create a biological weapon? Thunder Down Under: A Look At Our Future? What If There Were Rules for Science Journalism? You Are Not So Smart: Why You Have Too Many Friends on Facebook, Why Your Memory Is Mostly Fiction, and 46 Other Ways You’re Deluding Yourself, by David McRaney. “An entertaining illumination of the stupid beliefs that make us feel wise. You believe you are a rational, logical being who sees the world as it really is, but journalist David McRaney is here to tell you that you’re as deluded as the rest of us. But that’s OK — delusions keep us sane. 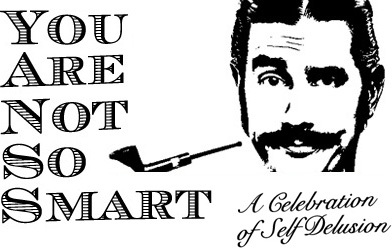 You Are Not So Smart is a celebration of self-delusion. It’s like a psychology class, with all the boring parts taken out, and with no homework. Dunbar’s Number — Humans evolved to live in bands of roughly 150 individuals, the brain cannot handle more than that number. If you have more than 150 Facebook friends, they are surely not all real friends. Hindsight bias — When we learn something new, we reassure ourselves that we knew it all along. Confirmation bias — Our brains resist new ideas, instead paying attention only to findings that reinforce our preconceived notions. Brand loyalty — We reach for the same brand not because we trust its quality but because we want to reassure ourselves that we made a smart choice the last time we bought it. There were 6,491 daily visitors this week. There were 29,134 daily visitors in December, 2011.